My day job has been taking up time recently, so I'm now trying to catch up on projects that were not quite ready for Telford earlier this month. 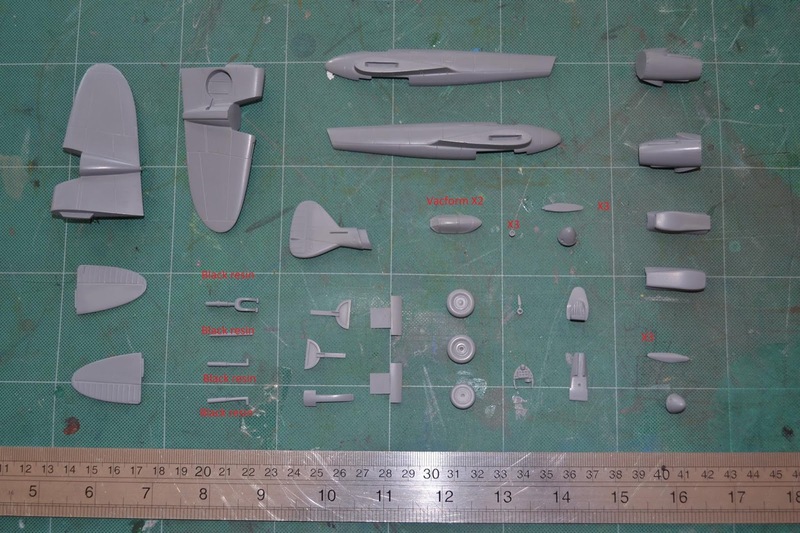 One of these is a new 1/72 complete resin kit, beautifully cast by CMR. A sample batch were delivered at the show but not put on display. The kit is of the twin engined Supermarine 327, or Supermarine F.Mk.I 'Shrew' as it might have been had it got beyond the mock up stage in 1940. It seems fitting to adopt the unofficial name 'Shrew' as it was destined to replace the Spitfire (the design sharing the same elliptical wing). It has become a tradition at Freightdog that my good friend Mike McEvoy gets to built my new kits first, and this will be previewed on his website www.grumpyoldmodeller.com in the coming weeks. Picture shows original masters by Paul Lucas, I still need to assemble a sample and finalise instructions over the next few weeks, with release likely in January.